The Rio Grande men’s and women’s golf teams pose with their championship trophies after taking the title in last weekend’s Johnson University Spring Classic in Sevierville, Tenn.
SEVIERVILLE, Tenn. — The University of Rio Grande defeated Oxford College at Emory University to take the men’s championship of the Johnson University Spring Classic at Sevierville Golf Club. The RedStorm finished with a two-day total of 664, good enough for a 50-stroke victory. Golfers representing the host school, Welch College and Hiwassee College also participated. Sophomore Jarod Lemaster (Jackson, OH) took medalist honors for Rio, carding a two-day total of 163. He was also responsible for the RedStorm’s best individual round of the event, finishing with a 79 on day two. Also representing Rio Grande was freshman Colton Blakeman (Piketon, OH), who finished second overall with a total of 164; freshman Levi Chapman (Pomeroy, OH), who tied for fourth at 169; junior Logan Sheets (Bidwell, OH), who placed seventh at 173; and freshman Payton Bentley (Peebles, OH), who was ninth at 177. The Rio women’s team also defeated Oxford College at Emory University for the tourney title. 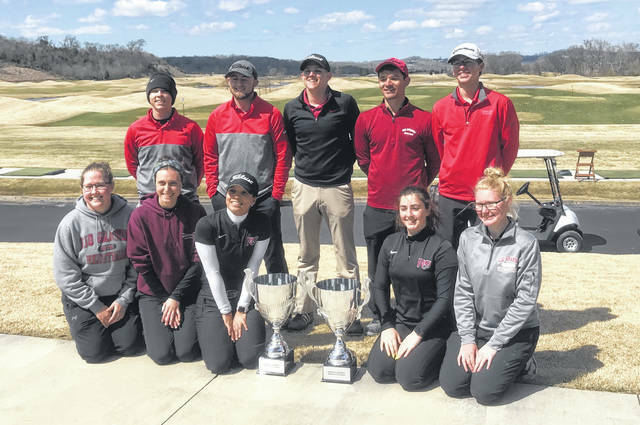 The RedStorm posted a 68-stroke lead with four golfers competing for each school in the opening round and added 28 strokes to its advantage with three participants for each school in the final round. Rafaella Gioffre (Huron, OH) had the top individual score in the event with a two-day total of 177. She also had the top individual round with an 83 on Saturday. Also representing Rio Grande was freshman Abby Eichmiller (Vincent, OH), who placed third with a two-day score of 192; freshman Elizabeth Leach (Waterford, OH), who carded a 36-hole total of 218; freshman Hunter Rockhold (Clinton, OH), who finished with a 94 in her one round; and freshman Madison Duskey (Beverly, OH), who had a 112 in her only round. The RedStorm men returns to action on Friday at Ohio University-Chillicothe. The Rio women are back in action April 14-16 at Indiana University Kokomo.